A quick side note before we begin, I’ll be moving Mack’s Hacks to Tuesdays as it better fits my hectic schedule. Plus then it works for #tiptuesday. If you haven’t noticed, I’m a sucker for alliteration. Plastic glue is one of those subjects that hobbyists either don’t care about or have incredibly strong feelings on. I used to not care, but as my skills improved, it became a…sticking point. Back in the day I, like most buddening scale modelers, used the thick Testors glue that came in the orange tube. Back then, many places only carried this (and the blue non-toxic version), so it was easy to assume this was the only option in model glue department. Do yourself a favor, stay away from this stuff. As a glue, it’s horrible. It’s too thick and likes to string everywhere—making it a pain to apply. It’s far too easy to over apply and make a hash of your project. It does have some uses, but none of them are in the “joining two pieces of plastic together” realm. Back then I had little choice (no internet and no close hobby shops), but these days? The world is your oyster. 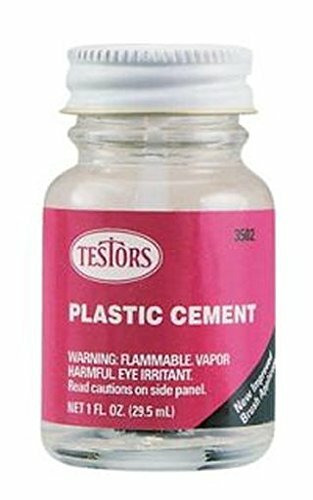 The most common step up from Testors tube glue, is Testors Liquid Cement. This stuff is way better than their tube glue, but otherwise is kinda “meh”. It, for awhile, was the most widely available liquid glue marketed for hobbyists, but now that seems to be no longer the case. If you can’t find anything else, this will do. After that, my old favorite was Tamiya Extra Thin. As the name suggests it is very thin, and the included application brush is small and perfectly sized for doing most small jobs (Testors Liquid Cement also comes with a brush, but its pretty large). It’s also quick setting and does a really good job of welding the plastic together. The square glass bottle is also nice as it’s much harder to topple over. After I used Tamiya Extra Thin for awhile I heard about something called “MEK”. No no no. 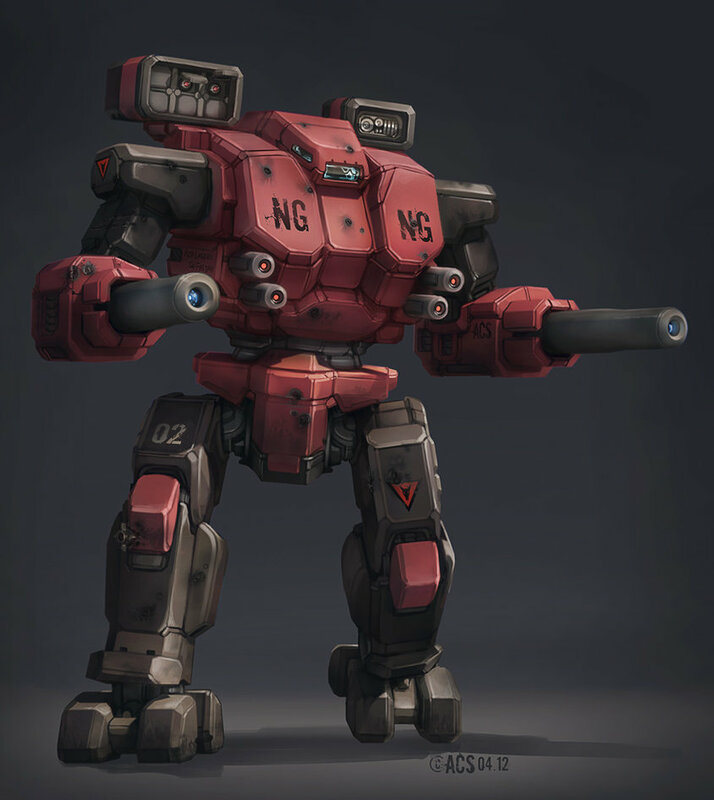 MEK, not Mech. MEK stands for Methyl Ethyl Ketone and its often used as a commercial solvent for painters and other tradespeople. It’s also seemingly (at least according to the wisdom of the internet) the primary ingredient to Tamiya Extra Thin as well as another favorite, Plastruct Bondene Cement. Furthermore, it’s available at most hardware and home improvement stores in large, quart (32 oz/946ml) sizes for the same price as a single bottle of Tamiya Extra Thin which is 1.3oz (40ml). So how does it work? Fantastically! It’s a bit “hotter” than Tamiya, meaning it works quicker, but most of the time for me, that’s not a problem. A bond on smaller parts is usually set in under 30 seconds, lessening the need for rubber bands or clamps. It also bonds just as well or better than Tamiya’s offering. 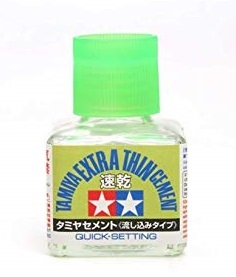 So If you’re looking to try a different glue, I recommend picking up a bottle of Tamiya Extra Thin and when you run out of that, go grab a can of MEK locally to refill it. Those two purchases should last you many years of model and plastic miniature building. All of these glues are potent solvents and have quite a smell. Make sure to use in a well-ventilated environment and wear a respirator. MEK is a bit stinker than Tamiya but not by a lot——it won’t be noticeable if you’re following safety precautions. None of these glues will work on PLA plastic prints, you’re going to have to use CA/Superglue for that. MEK may work on ABS, both as a smoothing agent (as opposed to Acetone) and as a glue. I’ve had varying degrees of success with it, likely due to the different makeups of the various brands of ABS I’ve used.